Introduction: Although an increasing number of reports and publications have dealt with the laparoscopic partial liver resection, this procedure has not been widely developed, and its feasibility, safety and effectiveness are still not established because of technical difficulties. 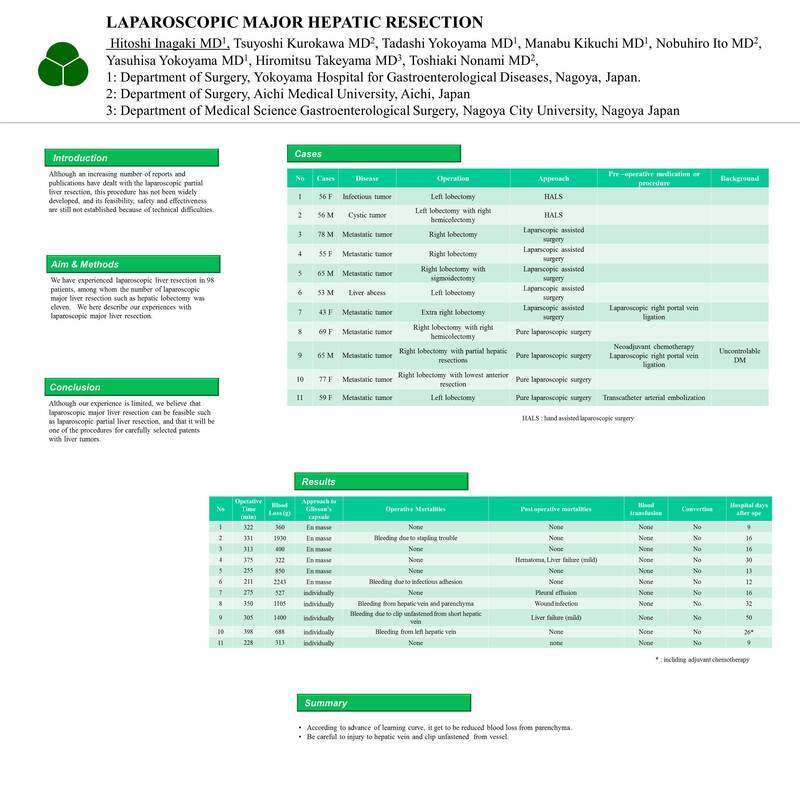 Aims & Methods: We have experienced laparoscopic liver resection in 98 patients, among whom the number of laparoscopic major liver resection such as hepatic lobectomy was eleven. We here describe our experiences with laparoscopic major liver resection. Results: Three patients had benign liver tumor and 8 had metastatic liver tumors. We performed laparoscopic right portal vein ligation to obtain enough volume of future liver remnants. We used hand-assisted surgery for 2 patients in the early period, laparoscopic-assisted surgery for 5 patients and recently pure laparoscopic surgery for 4 patients. Operative complications occurred in 4 patients included staple trouble, bleeding from liver parenchyma, short hepatic vein, and left hepatic vein. There was no conversion to open surgery. Conclusions: Although our experience is limited, we believe that laparoscopic major liver resection can be feasible such as laparoscopic partial liver resection, and that it will be one of the procedures for carefully selected patents with liver tumors.